With game related projects at the center of our business, AMATA is constantly working to create new and innovative entertainment content in a wide variety of fields such as VR, video, comics, and media. Our vast experience with game development has allowed us to work on games in a wide range of genres, such as RPGs, action games, simulation games, puzzle games, and more. 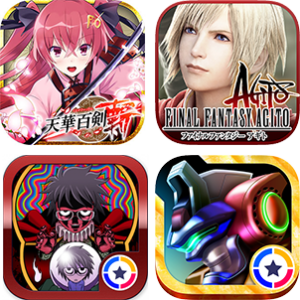 Fans and clients alike trust us from our work on large scale titles such as TENKAHYAKKEN -ZAN- (DeNA Co., Ltd.) and FINAL FANTASY AGITO (SQUARE ENIX CO., LTD.). With our original VR title, Last Labyrinth, we will be broadening our focus to include high-end content such as VR/AR, home console, arcade, PC, and multiplatform titles. We have also begun expanding into video content planning and production, with our first TV drama Final Fantasy XIV: Dad of Light. Per our mission, Make the World More Entertaining, we are working to become a force not only in the Japanese entertainment industry, but on a global scale. We plan, develop and oversee the operations of video games. We create games for a wide variety of platforms, including mobile, consumer, PC and arcade. Our company boasts a large number of members who are veterans of their respective fields, with extensive experience in game development and publishing. As such, regardless of whether its RPG, action, simulation, puzzle or racing games and so on, genre is no objection. Coupled with on-board operations staff, contracted operations management for online games would also be possible. By constantly operating along multiple development lines, and sharing the technology and know-how in between them, we are constantly moving forward with an organizational structure that allows us to always respond to the very latest in technological changes. With our company boasting over 130 members, in-house mobility and flexible line organization are among the many advantages that we possess. In addition to the planning, development and management of large titles, we are also capable of producing mock-ups and prototypes for projects in small groups. With a large number of in-house international employees, and experience in working with overseas game companies, we are capable of providing overseas development support for our clients as well. We plan and develop VR content. In addition to mobile VR, we have ample experience in developing high-end VR content, including for the PlayStation VR, Vive and Oculus Rift. We provide one-stop development services, beginning with project proposals emphasizing experiences unique to VR, to programming and creating real-time 3D computer graphics. Consultations regarding technical support such as shading work and game optimization would also be available, and proposals for VR content development, including the utilization of external equipment such as moving sheets and others are also possible. We plan, create, produce and monetize video content. As a company with numerous producers, each with extensive careers in the film industry, we are capable of undertaking the planning, production and monetization of various types of video content, including television dramas, internet broadcasting content, VR content (360-degree videos) and so forth. By being involved right from the beginning planning stages, we provide proposals that maximize the value of your content. We undertake graphics production for all types of games. In addition to producing 2D graphics for user interfaces, character / monster designs and backgrounds, we also produce 3D graphics, including 3D character models, background models, motions and effects. With a large team of industry veterans, each equipped with an abundance of experience ranging from low-polygon graphics for mobile to high-end graphics for household gaming, real time graphic production is our forte. Please do not hesitate to contact us too for orders regarding individual design production. We undertake sound production for games, VR, video and so forth. With members experienced in sound production for household, arcade and mobile games, we accept a wide range of requests, including original BGM and SE production, MA work, voice editing, voice actor casting etc. and so on. We also accept individual sound production orders, so please do not hesitate to contact us. We manage the “Otaku Industry” news site, which distributes business news from within the “otaku” (geek) domain of the entertainment industry, including video games, manga, anime and novels etc.. By keeping on top of industry trends through the absorption and distribution of specialized otaku industry information, and through collaborations with AMATA’s various business lines, we are capable of maximizing the values of our proposals. We develop systems for non-gaming usage as well, including websites and applications. With the know-how gained through media content management as well as game development / game management , we are capable of providing a wide range of services, including business schemes and content management proposals, server infrastructure proposals and building, as well as operations and management etc. Please do not hesitate to contact us right from the launching stages of your project. With the skills and capabilities of AMATA’s many members, we are constantly challenging ourselves in the many areas of the entertainment content industry.